Who knew Deadpool had so much range?! 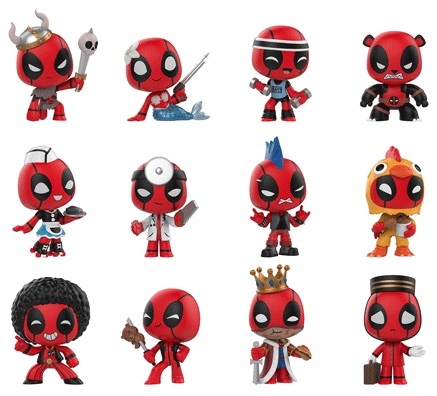 The 2018 Funko Deadpool Mystery Minis set showcases the "Merc with a Mouth" in a variety of playful outfits. Featuring very little overlap with the larger Pop! figures, the Funko Deadpool Mystery Minis lineup reimagines Deadpool in many different forms. This includes Deadpool as a lounging mermaid with a spear gun, and Deadpool dressed in a full chicken costume, eating from a bucket of fried chicken. 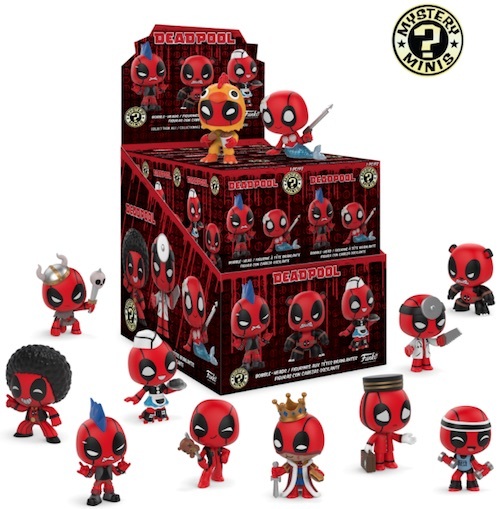 Buy Deadpool Mystery Minis on Entertainment Earth. Although simple in theory, Funko Deadpool Mystery Minis gives collectors more trouble because there are four different formats, each with their own exclusives. The main Deadpool set has a skewered teddy bear, a king holding a burger and sword, and a bellhop. On top of that, GameStop boxes offer a cheerleader, clown and wizard, while Hot Topic features Robin Hood, a knight holding a unicorn head, and a samurai warrior with a sword filled with tacos. Finally, collectors must visit Target to get the boxer (with a black eye), hula dancer and an old lady using a walker. This all adds up to 21 figures in the Funko Deadpool Mystery Minis set. Beyond the blind-box format which keeps the contents a surprise, the other unknown is the individual figure rarity, assuming, of course, they all don't fall at the same odds (1:12). Specific box odds will be added when available, so check back to see which choice is the hardest to uncover. Funko RARE Mystery Mini Deadpool Wizard 1 72 Gamestop LOWEST PRICE! FREE SHIP!